They were two inseparable brothers, a married couple of nearly 62 years, a respected doctor and one was a 97-year-old woman. All had come to the Tree of Life temple in Pittsburgh on Saturday morning to pray and find peace in each other's company, only to be targeted by an alleged killer with a twisted anti-Semitic motive. A day after the rampage at the synagogue in the normally tranquil neighborhood of Squirrel Hill, loved ones and friends of the 11 people gunned down were left mourning and outraged by the explosion of deadly hate that entered their beloved place of worship. 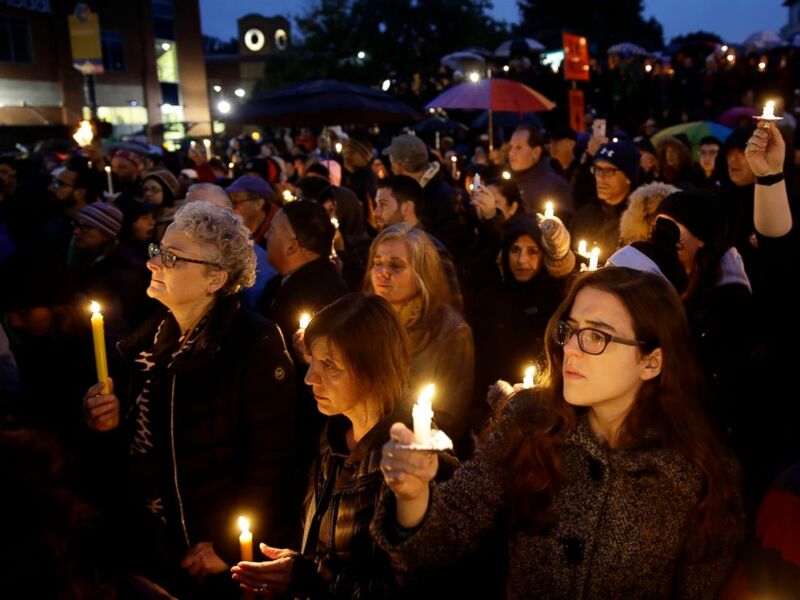 "The fact that this attack took place during a worship service makes it even more heinous," Scott Brady, the U.S. attorney for the Western District of Pennsylvania, said at a news conference in Pittsburgh on Sunday morning. "A place of worship is a sacred place. It's a place of peace and a place of grace. It's a place where a community comes together. And this, of course, is our first freedom as a people." The names of those killed in the Saturday morning massacre, allegedly carried out by Robert Gregory Bower, 46, of Pittsburgh, were released Sunday by the Allegheny County medical examiner. The oldest victim was 97-year-old Rose Mallinger, who lived in the Squirrel Hill neighborhood and was a faithful member of the Tree of Life temple. Bernice Simon, 84, and her husband, Sylvan, 86, were married at the Tree of Life synagogue in December 1956, and died together there on Saturday. "They held hands and they always smiled and he would open the door for her, all those things that you want from another person," a neighbor of the couple, Heather Abraham, told the Pittsburgh Tribune-Review. "They were really generous and nice to everybody. It’s just horrific." Brothers Cecil and David Rosenthal were at the synagogue together and were gunned down, officials said. Cecil was 59 years old, while his brother was 54. The Rosenthal brothers were inseparable and attended services at the synagogue every Saturday, said Chris Schopf, vice president of ACHIEVA, a Pittsburgh residential and employment program for people with disabilities that the siblings received assistance from. "They loved life. They loved their community. They spent a lot of time at the Tree of Life, never missing a Saturday," Schopf said in a statement. "They were as much a part of the ACHIEVA family as they were their beloved neighborhood of Squirrel Hill. Our collective hearts are heavy with sympathy to the Rosenthal family, and to all those affected by the tragedy at Tree of Life." Freddy Rabner, a member of the Tree of Life, said Cecil Rosenthal "didn't have a mean bone in his body." "He was a jovial guy. He greeted everyone who walked into the synagogue with a handshake," Rabner said. "He's one of the guys if I'm driving home from work, I'd toot my horn and he'd give us a wave. He's a good-hearted individual who was the victim of senseless violence." Scott Levin, a longtime member of the synagogue, said the Rosenthal brothers had been attending services there since they were little boys. He said the brothers were slain in a temple they considered "their safe spot." "They lived for the temple," Levin said. "They were always there and never missed a service. They were loved by everyone. It was like a home to them." Victim Joyce Fienberg, 75, was originally from Toronto, Canada, where she grew up a member of the Holy Blossom Temple, Rabbi Yael Splankey posted on Facebook Sunday. "She was married here. Her confirmation photo is on our wall of honor," Splanky wrote of Fienberg, who had moved to Pittsburgh years ago and joined the Tree of Life synagogue. The other victims included Richard Gottfried, 65, of Ross Township, Pennsylvania; Dr. Jerry Rabinowitz, 66, of Edgewood Borough near Pittsburgh; and Irving Younger, 69, of the Mt. Washington neighborhood of Pittsburgh. Daniel Stein, 71, and Melvin Wax, 88, both of Squirrel Hill, were also shot to death. Law Claus, former Allegheny County deputy district attorney, said Rabinowitz was his family's physician. "Dr. Jerry Rabinowitz was more than just a physician for me and my family; for over three decades he was truly a trusted confidant and healer who could always be counted upon to provide sage advice whenever he was consulted on medical matters, usually providing that advice with a touch of genuine humor," Claus told ABC affiliate station WTAE-TV in Pittsburgh. "He had a truly uplifting demeanor, and as a practicing physician he was among the very best." The University of Pittsburgh Medical Center tweeted that Rabinowitz was affiliated with its Shadyside Hospital. "Jerry was above all one of the kindest physicians and human beings in our community," UPMC tweeted. Tami Minnier, UPMC chief quality officer, released a statement mourning the loss of Rabinowitz. "Those of us who worked with him respected and admired his devotion to his work and faith," Minnier said in her statement. "His loss is devastating, and we extend our deepest sympathies to his family, friends, and fellow UPMC colleagues who loved him." Wax was a retired accountant and a member of the New Light congregation, which rented a space in the lower level of the Tree of Life temple, Myron Snider, an official of the New Light congregation, told the Associated Press. "He was such a kind, kind person," Snider said of Wax. The Pittsburgh Steelers held a moment of silence before Sunday afternoon's football game at Heinz Field in Pittsburgh to honor the victims. "On behalf of the entire Steelers organization, we offer our support and condolences to the families of the attack on peaceful citizens worshiping at the Tree of Life synagogue. Our hearts are heavy, but we must stand against anti-Semitism and hate crimes of any nature and come together to preserve our values and our community," Art Rooney II, the president of the Steelers, said in a statement. President Trump offered condolences on Twitter and ordered that flags be lowered to half-staff at the White House and other federal buildings. Erika Strassburger, a Pittsburgh City Council member who lives two blocks from the synagogue, said she knew some of those killed. "The sadness and the fear ... was immediately apparent with the people I was with [and] was heartbreaking," Strassburger said on ABC's "This Week" Sunday morning of when she first learned of the mass shooting. "And I got on the scene as soon as I could just to find out more. The hardest part is waiting to find out more." 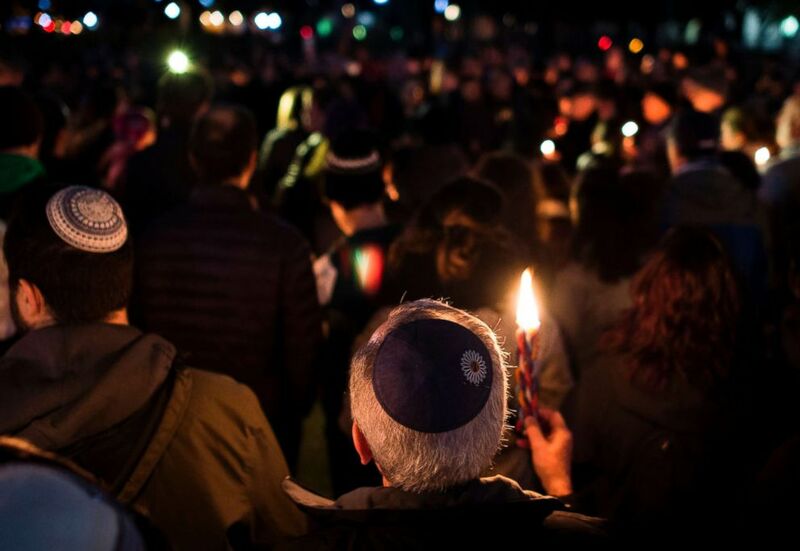 On Saturday night, hundreds of community residents gathered near the synagogue for a candlelight vigil. Another vigil to remember the victims took place Sunday evening. "For a Jewish community and especially for the families who've been affected, and it's real when once you hear the names, we're going to do everything we can to help the families," Jeffrey Finkelstein, the chief executive officer of the Jewish Federation of Greater Pittsburgh, said at Sunday's news conference. "We're in the process of doing that now and we'll be there for them and be there to help our Jewish community in the Pittsburgh."